Notification with the passing of Delta Golden Wings member retired Delta pilot Captain Robert H. McNichols, age 78. 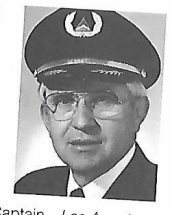 Captain McNichols joined Delta Air Lines 06-13-1966 and retired with Delta based ATL/031. Captain McNichols was widowed December 24th, 1994. He is survived by their children and grandchildren. To view/sign the online guestbook please visit http://www.cannonclevelandfunerals.com/sitemaker/sites/Cannon1/obit.cgi?user=72652144_RMcNichols Services for Capt. McNichols will be conducted this Saturday May 21st in Georgia...please see below. Robert Howard McNichols, age 78, of Stockbridge, GA died Monday, May 16, 2016. He was born in Salt Lake City, UT to the late Johnathan Howard and Katherine Stanchfield McNichols. He was also preceded in death by his wife Virginia J. McNichols. Robert “Bob” was a member of St. Joseph's Episcopal Church, in McDonough. He graduated from the University of Utah with a Bachelor's Degree, paying his way through college as a Salt Lake City police officer. He served in the U.S. Air Force during the Vietnam War and retired after 30 years of service with Delta Air Lines as a pilot. He was an avid RV'er, enjoyed fishing, making friends and collecting trains. He will always be remembered as a devoted husband, father, grandfather, brother, uncle and friend. Mr. McNichols is survived by his children; Kenneth Howard McNichols, Reno NV, Leigh (Stacy Alan) McNichols Hall, Marietta, GA, Brian (Diane Elizabeth) McNichols, Ft. Worth, TX, his siblings; Mary (Jim) Guilford, Prescott, AZ, Nancy (Harley) Mills, Battle Mountain, NV; his 5 grandchildren, Ginger Emma Hall, Elijah Howard McNichols, Mariel Tenley Hall, Brianne Elizabeth McNichols and Silas Edward McNichols; and his 6 nephews and 2 nieces. Memorial Services will be held at 4:00 pm on Saturday, May 21, 2016 at St. Joseph's Episcopal Church with Fr. Scott Harding officiating. The family will receive friends Saturday, May 21, 2016 from 3:00-4:00 pm at St. Joseph's Episcopal Church. In lieu of flowers, please make a donation to the charity of your choice.